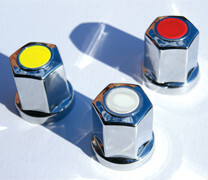 The only lug nut cover that provides safety, good looks, and a universal fit. Vibration and bolt fatigue are the leading causes of self-loosening wheel lug nuts and joint failure. Visual inspections by trained mechanics can detect a loosened wheel lug nut, however to an untrained eye, a loose wheel lug nut looks tight. Additionally, many truck, trailer, bus and RV owners dress up their wheels with lug nut covers, so using a Loose Lug Nut Indicator that only fits the bare lug nut is not an option. That’s why RealWheels has developed the LugCheck Loose Lug Nut Indicator. It’s the only cover that combines the safety of a visual Loose Lug Nut Indicator with the beauty of a chrome plated lug nut cover. 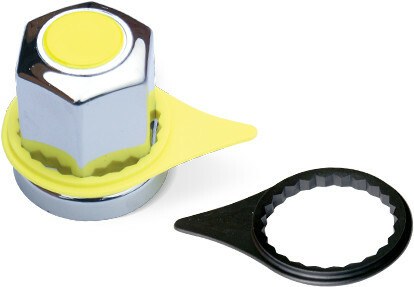 Introducing the first 32/33mm Universal Lug Nut Cover with optional Loose Lug Nut Indicator. Universal Design—Fits both 32mm and 33mm lug nuts. Lug nut cover is designed to accommodate our optional LugCheck Loose Lug Nut Cover Indicators—Allows for quick and easy visual inspection. Optional logo and reflective inserts available. Personalized domed logos or reflective inserts for added safety are available.